Specimen kindly loaned by Dr. Martin Luff A very local northern species with records from Cumbria, otherwise from the Scottish highlands, Orkney and Shetland. Adults overwinter and breed in the spring and summer, they occur beside mountain streams, upland bogs, wet grassland and lowland marsh. Its wider distribution includes Scandanavia and northern Russia, our British population being the southern limit of its distribution. We are not optimistic of finding this locally. 8.5-10mm. Upper surface with dense, strong microsculpture, entirely dull metallic green with coppery or violet overtones ¹. Head not wider than pronotum, densely punctured and roughly sculptured with a transverse area between front margin of eyes smooth, behind this with short longitudinal ridges, more evident laterally. Clypeus densely granulate and finely punctured. Labrum granulate, front margin smooth and bright golden-yellow with a series of setiferous punctures. Mandibles and palps metallic green. Antennae entirely dark and metallic. Pronotum strongly rounded to middle then almost straight to hind angles. Lateral border well developed, anterior part not visible from above. Surface strongly sculptured; convex behind middle and deeply depressed inside hind angles, puncturation sparse on disc, more dense around edges. Elytra widest behind middle, rather depressed and with weak surface sculpture, sides somewhat explanate behind basal third, side borders strong and obvious from above. Pupillate depressions shallow and weakly delineated, surrounding cuticle very weakly raised in most cases, each with a few scattered punctures, especially towards edges. Distinct darker areas between depressions not raised, blue to violet or reddish (Joy). Prosternum pubescent. Legs entirely dark, metallic and a little more shiny than pronotum and elytra. 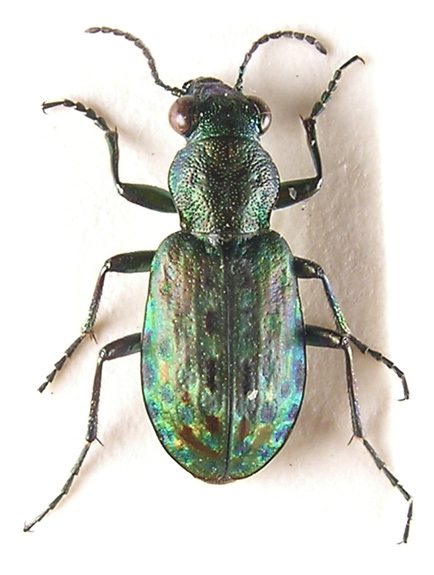 ¹ Colour is difficult to describe in these strongly metallic species and a specimen needs to be manipulated under strong light to appreciate this; from above the elytral marginal area appears dull metallic green with a blue lustre, viewed from the side this area turns a brilliant gold capped with red or maroon.